The 41-year-old Southampton man who was injured when the cement truck he was driving overturned in Paget is in stable condition on a general ward at the hospital. 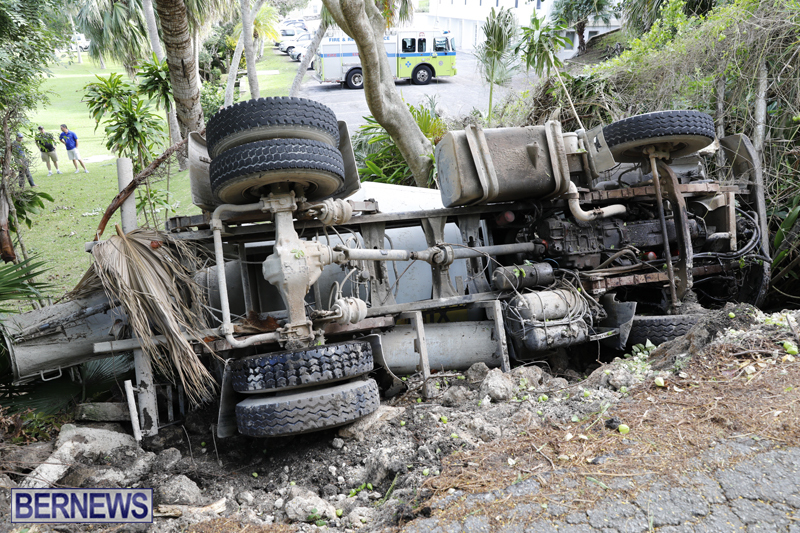 A police spokesperson said, “At last check earlier this morning [November 22nd] the 41-year-old Southampton man injured when the cement truck he was driving overturned on Seabright Avenue in Paget around 9am Tuesday was recovering in stable condition on a general ward at the hospital. “The damaged cement truck was eventually removed from the scene and roadside barriers were put in place for the safety of motorists traveling along the affected section of Seabright Avenue. That should ‘buff’ right out! Bet he was feeling a whole lot better after a change of pants. That must have been quite the trip.